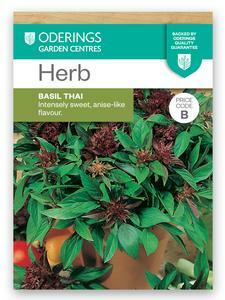 Oderings Garden Centre | Herb Seeds - Basil Thai, Intensely sweet, anise-like fragrance. The basil for Thai cuisine. Intensly sweet, anise-like fragrance. Matures in 60 days. Sow spring and summer. Approx 200 seeds.